Upgrading your countertop is a difficult and confusing process. There's a number of choices and trade-offs, each of which seems to fight for your attention and money. It's frustrating. Our goal is to help you find the countertop that fits your style, budget, and needs. Because we sell a wide range of materials and brands, we can spend our time considering your needs. It's a win for you. Check out the buyer's guide below. We'll give you the straight scoop about general pricing, pros and cons for each product. If you read this and still have questions, don't hesitate to ask us for some help. 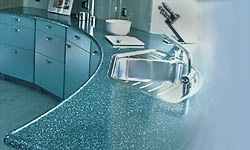 Pros: Solid surface countertops are cost-effective, durable, and attractive. They can be made into complex shapes and are virtually seamless to the eye. Because the material is consistent throughout the product, minor damage can be repaired -- usually by the home owner. Each solid surface product we carry also has matching integrated sinks, which can be seamlessly attached. Each solid surface product is warranteed for a minimum of ten years. Cost: Solid surface countertops are the least expensive upgrade countertop. They are an excellent value for the money. Prices vary by brand and color, but typically start at about $35 per square foot, including edging, 3-inch backsplash, and installation. Pros: Quartz countertops, sometimes called �engineered stone�, is a man-made product of natural materials. Using over 90% ground quartz � a semi-precious stone � quartz has a depth and luster unavailable in purely man-made surfaces. It is non-porous, and has thus received NSF certification for use in food preparation areas. It is very durable, resisting scratching and staining, and maintains a glossy finish. Cons: Though quartz is beautiful, it is both expensive, and still does not have all the �personality� of natural slab stone. There are no options for seamless, integrated sinks � though undermounted sinks are common and provide most of the same benefits. Pricing: Quartz is not cheap. Starting at roughly $75 per square foot, it is more expensive than most natural slab stone surfaces. Pros: The look of natural slab stone � usually granite in kitchen countertops -- cannot be duplicated. While other products have made advances in replicating the giant swaths and variations in color, there�s really no substitute for natural stone. No two natural stone countertops will be the same, thus whatever you choose will be a unique statement. Cons: With this exceptional beauty comes two major downsides: natural stone is porous, and must be �sealed� every six months or so. Even still, the pores are never entirely eliminated, and can potentially harbor grime or bacteria. In most home uses, however, regular household cleaning will be sufficient. Secondly, because natural stone is a natural product, it is not warranteed. Pricing: Most people are surprised to learn that granite is surprisingly affordable. Starting at about $65 per square foot, it�s probably less costly for the show-stopping beauty of granite than you expected. Depending on color availability, and because it is a limited resource, specific colors may be more expensive. Sometimes much, much more expensive.